Onity's feature-enhanced stand-alone in-room safe. Ideal safe combining attractive design and guest peace of mind. Also available in wall mount design. 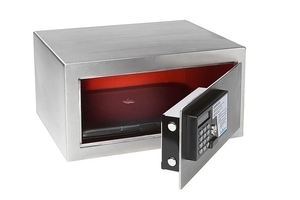 The cabin safe is an armored case, usually rectangular, for storing valuables. These devices protect valuables placed within. Such armored cases can have an electronic lock opened via a keypad code, a reinforced padlock or an armored lock and key. Generally, each cabin has its own safe integrated into a piece of furniture. Choice will depend primarily on safe size. Other factors include its thickness, constituent materials and lock type.